You are currently browsing the archives for the tag 'freja beha'. Sophistication and raw sensuality come together in Prada’s F/W 2013 campaign, shot by Steven Meisel in New York. A stellar ensemble of fresh new faces such as Amanda Murphy and Kristine Froseth star alongside iconic, era-defining stars like Christy Turlington and Freja Beha. They inhabit seductively stark scenes, the pivotal characters in an enigmatic portrait of femininity. Ladies, learn your fashion math! What equals a must-have? One dress on three covers would be a good answer! Every season has a few iconic looks that appear over and over again. 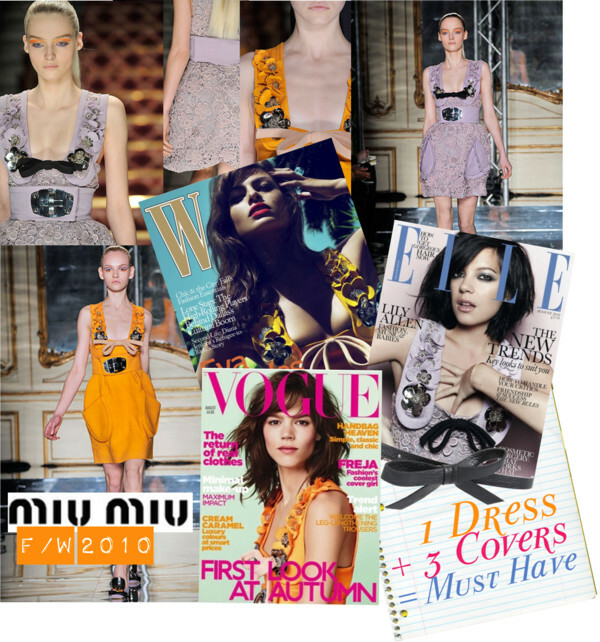 So one important piece for fall is the `60s inspired Miu Miu dress that comes in bright orange or lavender lace. Worn by Eva Mendes on the July cover of W, by Lily Allen for British Elle and Freja Beha for Vogue UK, both for their August covers. That is an unusual coincidence because editors do not like to share their lead picture. But some clothes have that certain something that makes everybody crazy for them. In this case, it is for sure not only the great cleavage! In Miu Miu stores this fall.